Some people thought MP3 files degrade overt time and opted to convert to FLAC regarding it offers better quality sound. But is this really the case? We're going to scoop the secret of converting MP3 to FLAC in following 3 parts. Actually, the idea of converting MP3 to FLAC is meaningless since you will just be increasing the size of your file MP3 consuming more space on your storage with the same sound quality. Another great misconception that needs to be clarified is the issue of MP3 formats degrading. MP3 is a lossy compressed format which suffers orgininal data loss when converted to FLAC, but nothing to do with degrade. However, there are situations forcing you to use a lossless format like FLAC, in that case you can read on to learn how to convert MP3 to FLAV. While converting MP3 to FLAV, you might consider a media converter that assures zero quality loss or allows you to edit tags on music. Well, look no more since Wondershare UniConverter (originally Wondershare Video Converter Ultimate) takes all accounts as it inputs audio formats like MP3, OGG, AAC, WMA and outputs over 1000 formats like FLAC, AIFF, APE, etc. without any quality loss. Moreover, you can use it to fix video metadata, burn DVD media and create your own playlist. Convert MP3 to 1000+ formats, like FLAV, M4A, AAC, etc. Now let us have a look at the detailed tutorial on how to convert MP3 to FLAC with Mac version. Download the program on the official Wondershare website and Install it. After that go to Applications folder and double-click on Wondershare UniConverter (originally Wondershare Video Converter Ultimate) to open it. On the home window, click on button. You will be able to upload a file from your local folder. You can also directly drag and drop the files to the program. 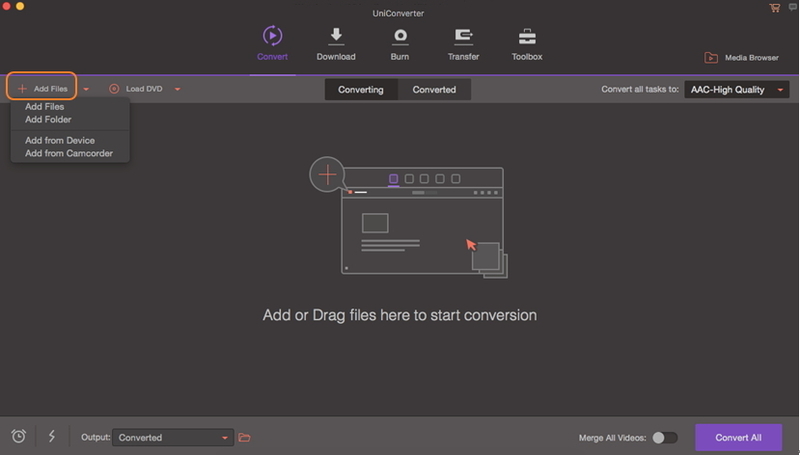 Tips: This video converter supports batch conversion thus you can upload several MP3 formats at one time. The imported MP3 file will be displayed on the program. Next, move the cursor the top right and click on Convert all tasks to:, a window will pop up asking you to select target output format. Click on Audio icon and a list of audio formats. Scroll through and click on FLAC format and then select the output quality. You can opt to retain its quality. 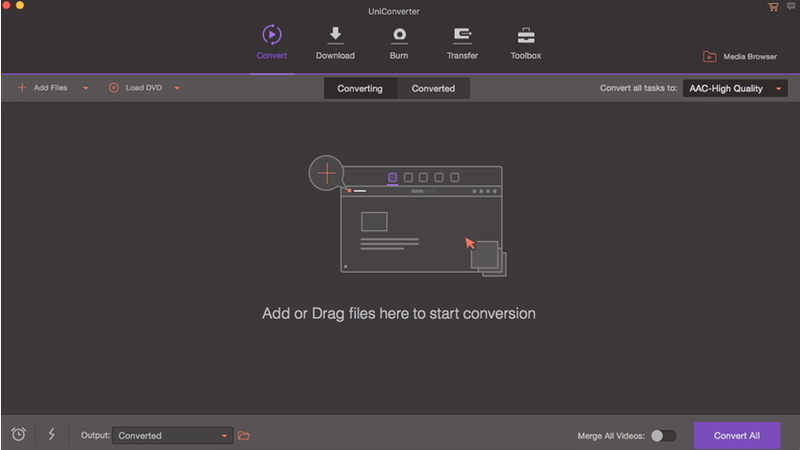 When you have done the correct output settings, you can now click on Convert All button and Wondershare UniConverter (originally Wondershare Video Converter Ultimate) will start converting MP3 to FLAC convert the file immediately. Other than using desktop audio converters, do you know that you can convert MP3 to FLAC using online converters? Yes, there are different online converters that you can use them to save your day when you have not installed a media converter. In this part, we will introduce you 3 popular free MP3 to FLAC Converter. Zamzar is an audio web-based converter that supports audio formats like MP3, FLAC, M4A, WAV, OGG, APE, MIDi and much more. Moreover, on this site, you will get free tips on the description of file formats. Here is quick guide on how to use it. Upload files from your local folder or download from online that is not more than 100MB. Choose an audio format as FLAC. Provide an email address to receive the converted email. Click on Convert and agree with terms of Zamzar. Open your email and download the newly converted FLAC file. Convertio is an audio format that allows you to convert MP3 to output formats like FLAC, OGG, AAC, WMA, WAV, CAF, AC3, GSM, AIFF, M4A and AMR. Other than that it can also convert images, videos, eBooks, documents, CAD, Vectors and much more. It is a reliable free online converter that supports upload of files from your computer, Dropbox, Google Drive and online sites that are less than 100MB. Here is a how to convert MP3 to FLAC using Convertio online converter. Click on Select Files to Converter and upload your desired MP3 file. Next, choose FLAC as your output format. Click on Convert to proceed. When the MP3 to FLAV conversion completes, just click on Download button. Online UniConverter (originally Media.io) is also a free MP3 to FLAC converter that you can use. This program is not only free to use but also has a great user interface. 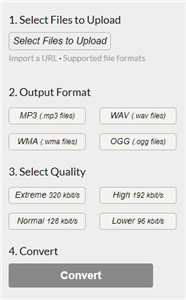 Online UniConverter (originally Media.io) supports audio output formats like WAV, FLAC, OGG and APE. Moreover, this audio converter supports batch conversion thus you can upload more MP3 files. Furthermore, it allows you to select an output quality of your file before converting it. 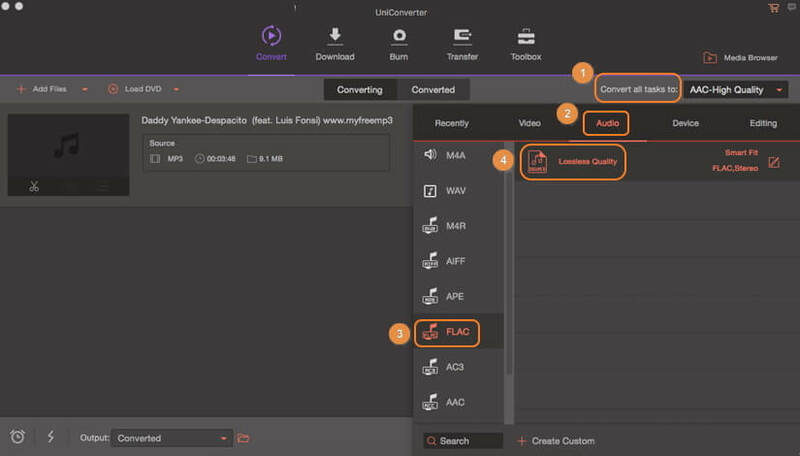 Here is how to convert MP3 to FLAC using Online UniConverter (originally Media.io). Visit the website and upload your MP3 file either from your computer or import from online by pasting MP3 URL file. Click on Convert button and then download the converted file to your computer. There you go, you can now converter MP3 to FLAC free using Wondershare Video Converter ulitimate or use free MP3 to FLAC online converters.